Erik Weihenmayer, renowned adventurer, author, filmmaker, and international speaker, will be the principal speaker at Lafayette’s 180th Commencement Saturday, May 23, and will be awarded the honorary degree of Doctor of Humane Letters. 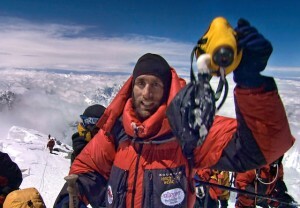 In 2001, Weihenmayer became the only blind person to reach the summit of Mt. Everest. When he climbed Carstensz Pyramid in West Papua in 2008 he completed his ascent of the Seven Summits, the highest point on every continent, finishing a quest that had begun with his ascent of Mt. McKinley in 1995. He also is the only blind person to finish the Primal Quest, billed as the world’s toughest endurance and adventure race; the only blind person to finish the Leadville Trail 100 Mountain Bike Race in Colorado within the prescribed time; and the only blind person to scale the 3,200-foot rock face of El Capitan in Yosemite National Park and the 3,000-foot ice face of Losar in Nepal. Blinded by retinoschisis by age 13, Weihenmayer established himself as a successful wrestler in high school, representing his home state of Connecticut in the National Junior Freestyle Wrestling Championships, and graduated from Boston College with a double major in English and communications. In 2005, Weihenmayer co-founded No Barriers USA to work with injured soldiers, disadvantaged youth, physically and emotionally challenged people, and others. He has led groups of sighted and non-sighted students to the Incan ruins of Machu Picchu in Peru, and he and his Everest team led a group of soldiers injured in Iraq and Afghanistan to the summit of the 20,100-foot Lobuche in the Himalayas. Weihenmayer completed his latest challenge in September 2014, kayaking all 277 miles of the Colorado River through the Grand Canyon with Lonnie Bedwell, a blind U.S. Navy veteran. Weihenmayer and Bedwell were nominated by National Geographic as Adventurers of the Year for 2014-15. Weihenmayer is the author of two books, Touch the Top of the World, which has been published in 12 languages and made into a movie by A&E, and The Adversity Advantage: Turning Everyday Struggles Into Everyday Greatness. A documentary of his Everest ascent, Farther Than the Eye Can See, won 21 international film festival awards and is ranked by Men’s Journal as one of the top 20 adventure films of all time. His many awards include induction into National Wrestling Hall of Fame and carrying the Olympic torch for the 1996 Summer Games in Atlanta and the 2002 Winter Games in Salt Lake City.